The Kalash are genuinely hospitable and welcoming to tourists. The valleys are peaceful and picturesque. Most visitors spending more time among the Kalash feel immense peace as if they had stepped in a parallel universe. If that is not for you, you could go hiking alternatively. Peace and tranquility are all very well, but after a few days absorbing the atmosphere, even the most relaxed traveler can reach saturation. 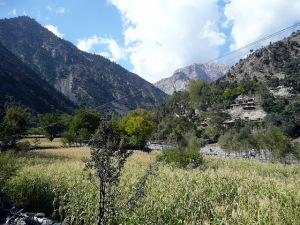 The trekking here is superb, but don’t be lulled into a false sense of security – just because the Kalash are hospitable doesn’t mean the landscape is. The trek between Brumboret and Birir is a one-day hike up to 3,000 meters, while trekking between Brumboret and Rumbur takes a day longer. It’s just as easy to get lost on both, so take lots of water and start early. It’s also advisable to take a guide. Like most places in the Hindu Kush, the tourist season is short and, as the temperatures drop, the slopes become covered with a deep layer of snow and are inaccessible for much of the winter. The same can go for the dirt tracks that link the valleys with the rest of Pakistan, so a bit of forward thinking is crucial. Many travelers time their visit to coincide with the spring festival of Joshi in May or Utjao in August, when the valleys really do come alive with the sound of music. It is possible to get a domestic flight from Lahore to Chitral and from there it’s just a three-kilometre taxi ride to the Attaliq Bazaar jeep depot, where there are daily services to the main valley of Brumboret. Passenger services to the Birir Valley are more infrequent. The best time to visit the valleys is from April to October; after that, bring your woollies!